MOCAP Tapered Plugs For Type L and M Tubing are designed for to plug and protect Type L & Type M copper tubing. The reinforced cross bracing provides for a secure fit and a slight pull-tab allows a grip for easier removal. Protects tubing from dust and damage during production, shipping and storage. 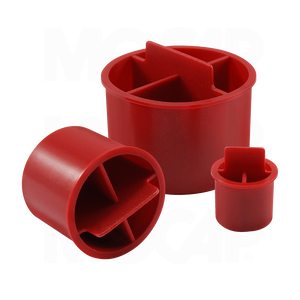 Our LMP Series Plugs are molded in Red polyethylene plastic and sized to fit Type L and M Tubing from 3/8 OD thru 4 1/8 OD. MOCAP stocks Tapered Plugs for Type L and M Tubing in many sizes for immediate shipment.